Gave my first SBG quizzes of the year on Friday. When I hand them back, I write a score of A, B, or Not Yet on them. I actually grade on a 4-point SBG scale, but I've renamed 4 to "A" and 3 to "B" since I enter a score of 4 as 100% and a score of 3 as 85%. Any score of 1 or 2 is a "Not Yet" because students are required to reassess until they earn a 3/4 (A/B). Those students who get an A the first time will get a sticky note stuck to their quiz. They will write their name on the sticky note and staple it to this board. I can't wait to watch it fill up! Here's the link to the Perfect Score First Try! Poster. 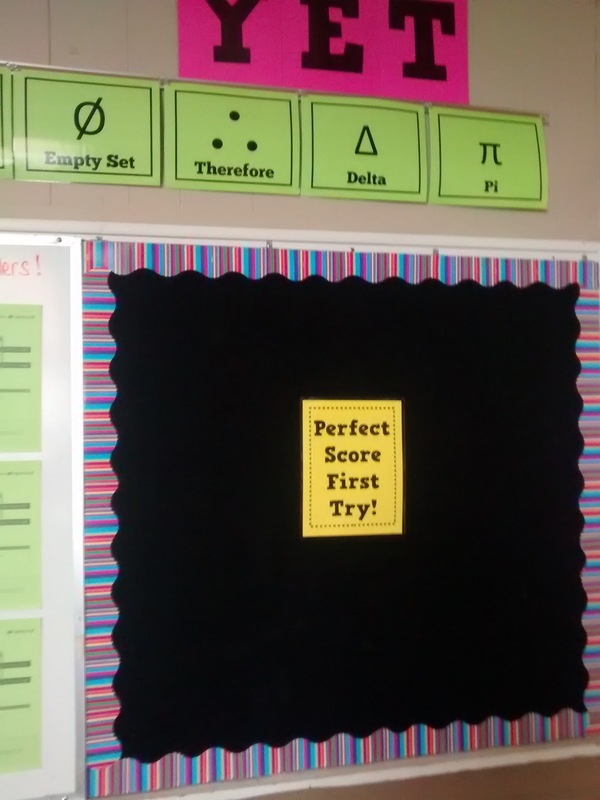 And, here's a link to my math symbol posters that are hanging above it. Also, if you want the YET posters, click here. 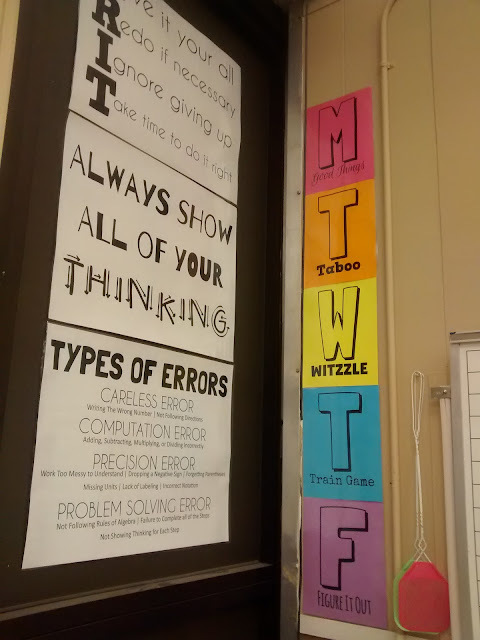 So, I've decided that the reason #Teach180 is working for me is that it seems doable. I can post one picture a day. I can write a caption. Most days, there are multiple pictures I could post. I teach three preps, and each prep is usually doing something unique. I just pick one of the neat things we did and post it. There's no need to be comprehensive. 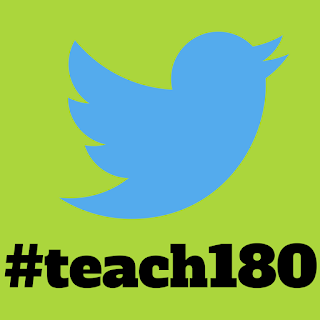 For me, #Teach180 is not about chronicling every thing I do in my classroom. Instead, it's my effort to stay plugged into the #MTBoS every day. I learn so much from twitter. But, it's usually the first thing that starts to slide when life gets busy. I know I'm a better teacher for those interactions with my tweeps, though. For the next few days, I'm going to try to approach my blogging in a similar manner. I usually blog a comprehensive idea at a time. For example, I usually blog an entire unit's worth of notebook pages at a time. What happens when I don't have a picture of one of the pages? That blog post gets put off and may never actually happen. I keep getting e-mails from people asking where the rest of my Algebra 1 INB pages from last year are. Well...this girl is a perfectionist. And, they're not perfect nor complete. And, that's kept me from writing those posts. I need to get over my perfectionism and get to blogging. That's going to be my blogging motto for this year. Hold me to it, guys. 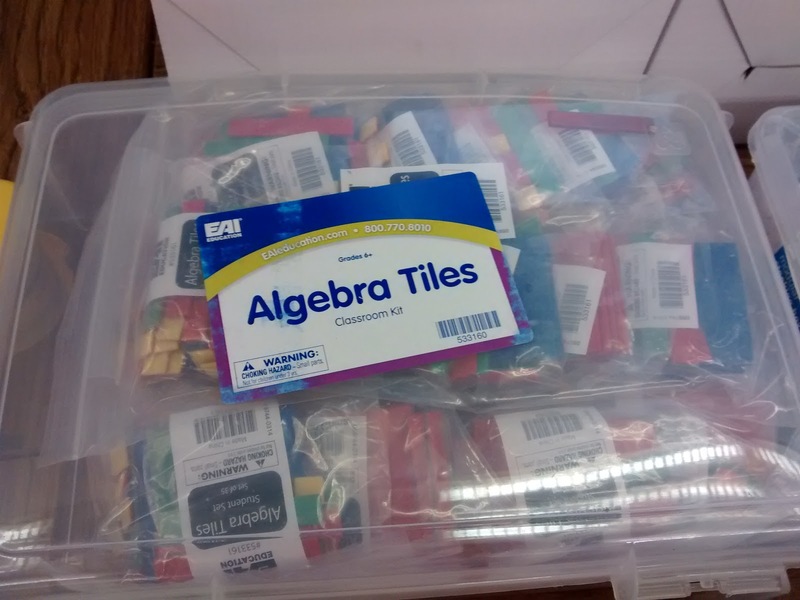 I got a classroom set of algebra tiles this year. I'm excited to use them to illustrate factoring, distributing, completing the square, and combining like terms this year. I tried using algebra tiles cut out of card stock one year. That was a disaster. Oh my goodness. Little bits of paper. Everywhere. I want these resources to be easily accessible to students whenever they need them. I want them to stay organized, too. 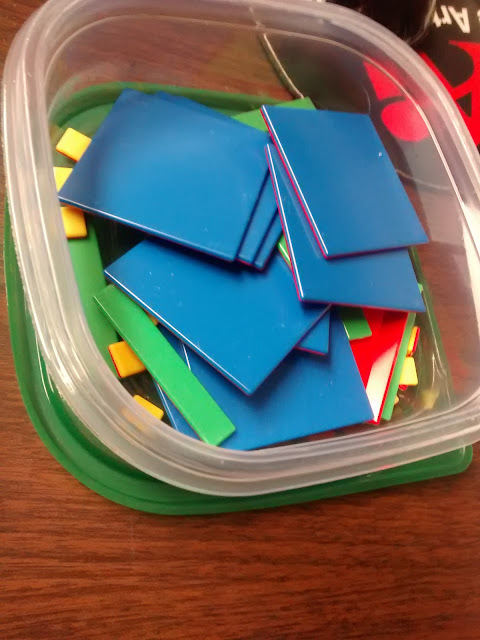 I saw a pin where an elementary teacher was storing base 10 blocks in tupperware-style containers that were divided into sections. I pinned it thinking I should do something of the sort with my algebra tiles. While in Dollar Tree, I saw sandwich containers that were 3 for a dollar. They're not divided into sections, but the price is definitely right! 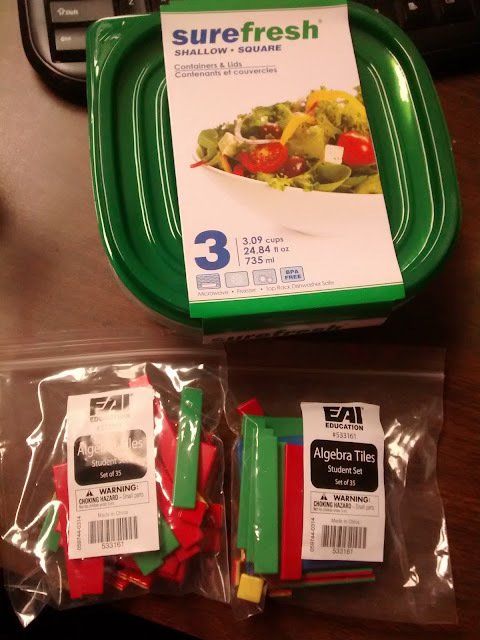 I'm going to put two sets of algebra tiles in each container. My desks are arranged in groups of four, so this will let my students share easily with their partner that is next to them or across from them. Here's what two sets in one container looks like. 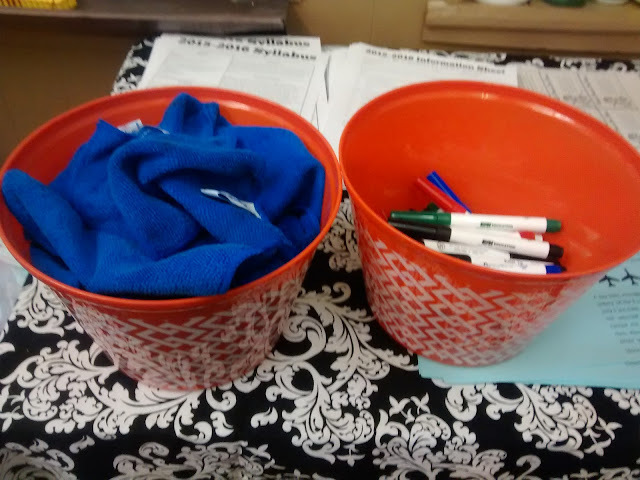 My thoughts: students can dig around in the container without dumping the contents of the bag on their desk. Less dumping should mean less pieces on the floor. And, I hope that making sure the lid is snapped on well comes more easily than making sure the bag is zipped properly. I could probably put a table's worth of pieces in each container, but I'm hoping that doing containers by each pair will increase participation of ALL students. 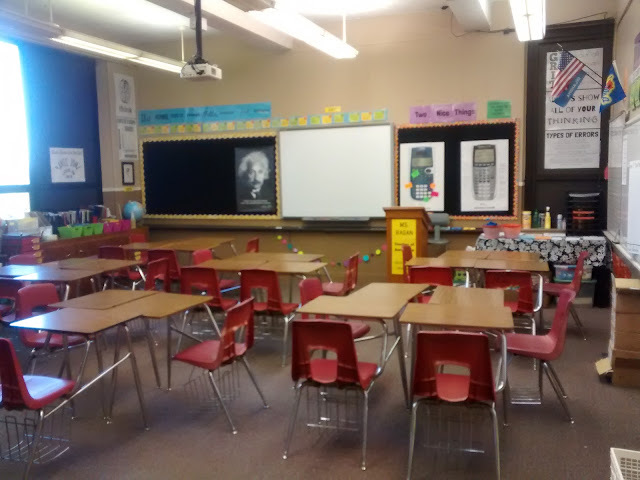 We're seven days into school, and I've only blogged about the first two days. Not off to the best start. 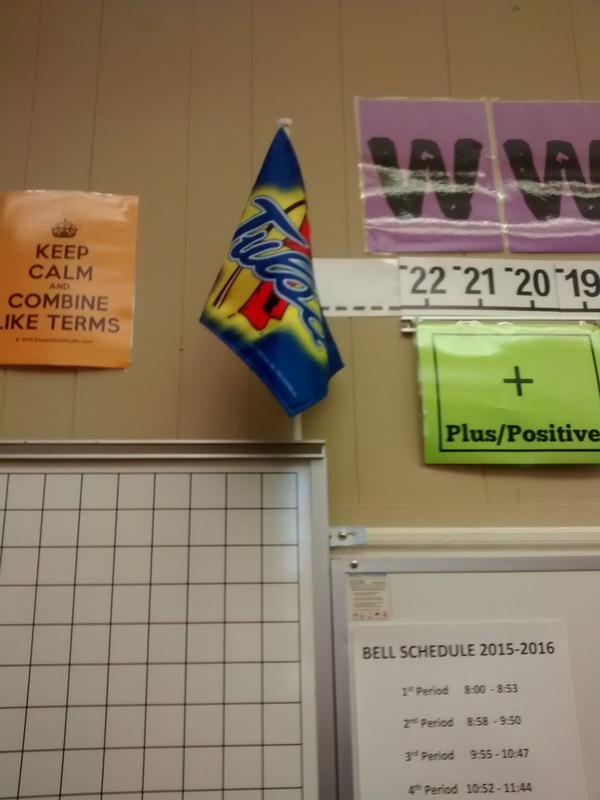 But, I am proud of myself for tweeting a #teach180 picture every day. Hopefully these pictures will all become blog posts of their own some day. I'm so excited about all the awesome people who have joined in with me to tweet something from their classroom every day! I really, really, really want to be in Nancy's German class! There were lots more amazing posts. But, it'd be silly to post them all when you can just look at them all by following this link. Hope you've found an idea to try. Or inspired you to follow the #teach180 hash tag on twitter for more awesomeness. Or maybe inspired you to start posting your own picture of the day on twitter? I know you have some amazing ideas, and I really want to steal them. One of the things I love most about the #MTBoS is that for every idea I blog, I seem to get three or more ideas back in return. Recently, Christine Mishra left a comment on an old post from 2013 with a link to a (new-to-me) logic puzzle: Futoshiki. Christine thinks these would be awesome to include in a unit on inequalities, and I agree! Here's the link she sent me to check out. Each column and row can only contain a number once. And, all inequality symbols must be obeyed. Here's a puzzle from the previous link. Clicking this puzzle will take you to the original source! Don't worry, there are smaller puzzles, too. They go down to a 4 x 4. If you're looking to try these out online, the best site we found was BrainBashers. It lets you make pencil marks which is a huge help in the problem solving process. 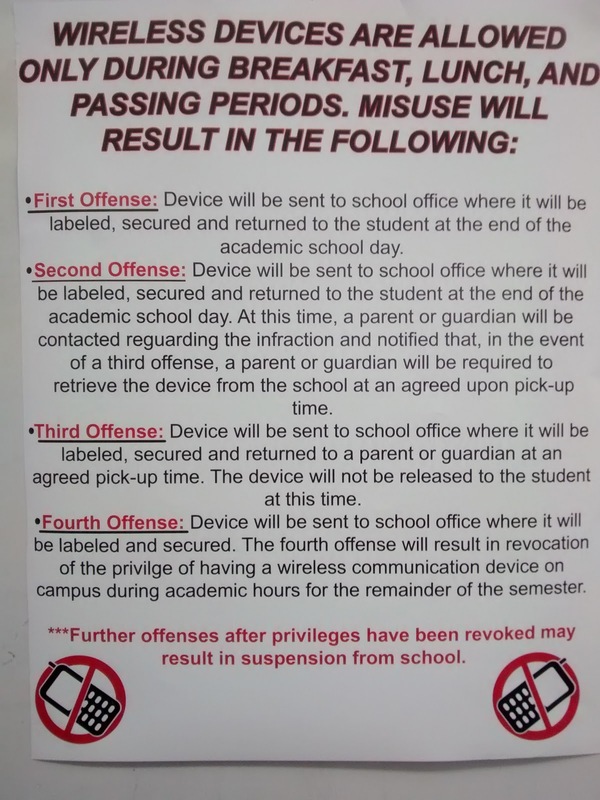 Anyone use these with students? Or have an idea of how to best use these? I'm thinking I'll give students one as a Figure It Out! Friday puzzle. Three class periods into Day 2, I was worried that I had messed up big time. I'd given my kids a brain teaser to work on. Nobody in second period figured it out. Nobody in third period figured it out. Kids were leaving my room frustrated. I was frustrated. Then, fourth hour happened. And, the whole day turned around. Day 2 ended up being one of my favorite beginning of the year activities. Ever. Guys, this is a keeper. Students entered my room to find this on the SMART board. A few students took "thinking cap" to mean "we can wear a hat even though it's against school dress code." Nope. On Day 1, students took a quiz about me and wrote me a quiz to take about themselves. 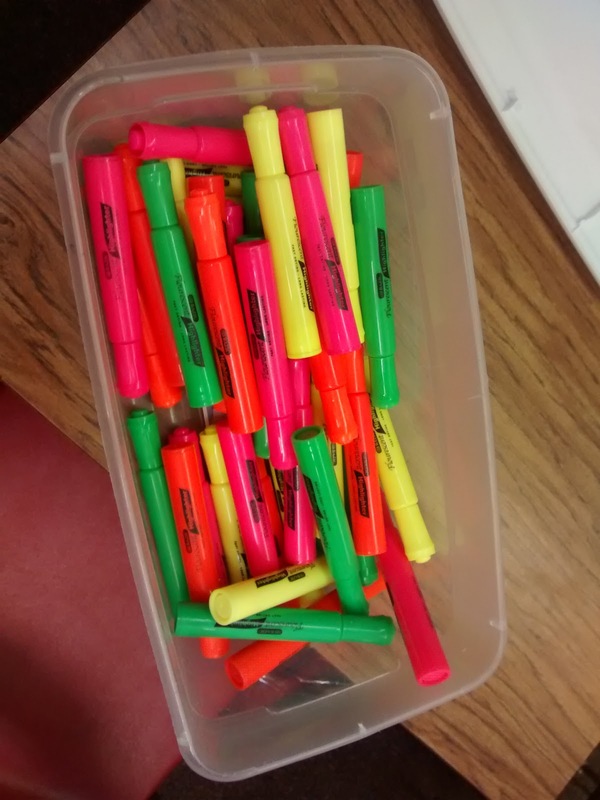 I passed these back along with highlighters to grade with. Oh my goodness. The kids had so much fun grading the quiz I had taken. I made a 100% on several quizzes. That freaked those kids out! I made a 0% on some of the quizzes, too. How does one make a zero on a quiz that is matching?!? I did accidentally put that one of my students was 25... She gave me more than a bit of grief on that one. And, answering that a kid has 10 dogs makes you sound a bit crazy. Some of my students realized that the correct answer to their question wasn't even in the answer bank they made... The kids corrected the quizzes and gave them back to me to study. I wasn't too sure how I felt about the whole quiz idea at the end of the first day. But, seeing their reactions when I gave their quizzes back was SO WORTH IT! Fridays in my classroom start with a puzzle or brain teaser for students to figure out. I put the name of the game up on the SMART Board. Then, I reminded them that the name of the game is important. Really important. We went over what to do when they thought they had figured out the puzzle. At this point, the kiddos were more than a bit confused. You may be too if you haven't read my previous two posts about this game here and here. I used the multiple dice feature on SMART Board to project five dice that roll with just a tap or click. I rolled the five dice. I told the students how many petals were around the rose. I asked them to come up with a theory of why that might be. They shouldn't tell me their theories. We'd test them in a minute. Then, I rolled the dice again and let them test their theories. We rolled. And rolled. And tested. And rolled some more. Like I said earlier, 2nd and 3rd period never figured out the puzzle. We stopped and took a syllabus break in the middle. I passed out my syllabus. Students highlighted key sentences. I gave them this parent information sheet to take home. Fourth hour, things started to turn around. One of my stats kids had seen this puzzle on youtube before. So, he answered the first three rolls correctly. This wowed his classmates. And, it let him earn a Fraternity of Petals Around the Rose membership card. He also got to sign the Fraternity poster. You can see the poster in this picture of my posters that will not stay stuck to the wall. Ugh... This is pre-signatures. The first student to get his name on the Petals poster just happens to be a twin. And, his twin just happened to be in the same class. Now, when one twin knows how to solve a puzzle and the other doesn't, this can be some super-motivation. Let's just say it was only a minute or two before the twin brother joined the Fraternity of Petals Around the Rose. The rest of the class now knew that the puzzle was possible to figure out. Within a few more minutes, there were multiple new inductees. 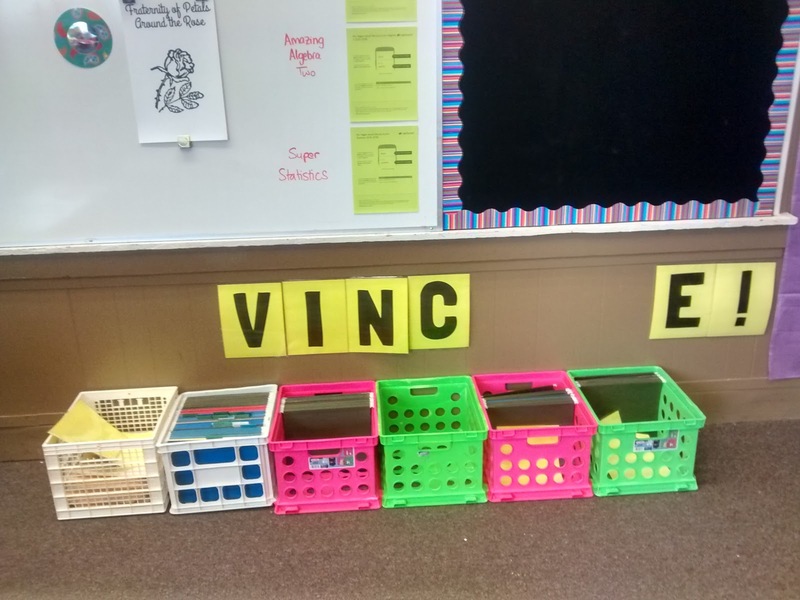 You could tell that some of their classmates were becoming quite frustrated. Those who understood the puzzle kept reminding those who didn't understand it YET that the name of the game was important. Some even took to yelling "Petals AROUND the Rose!!!!" in their neighbors' ears. That helped. Not. One of my students left class so visibly frustrated that people in the hall were asking him what was wrong! 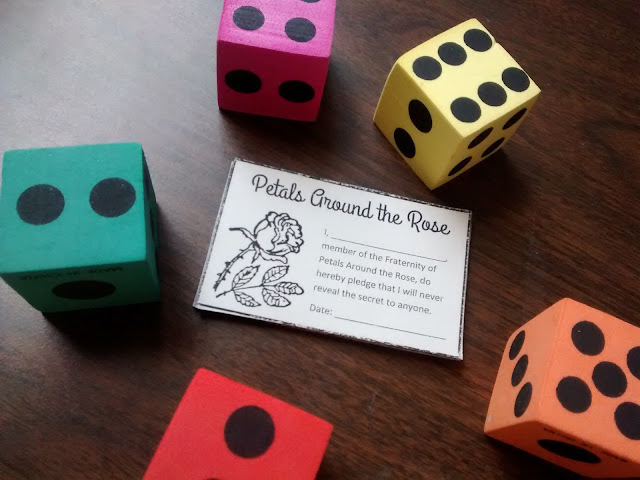 By the time lunch was over and fifth hour rolled into my room, talk about this petals game was all around the school. There was something powerful for these kids about seeing names on the Petals poster. Students knew the puzzle was possible because the names of their peers were on the poster for them to see. More names were added to the poster. More students left frustrated. Same thing happened seventh period. A student who doesn't even have me this year came by to ask about the puzzle because he had heard some friends talking about it and wanted to look it up online and try it. One student pulled out his wallet during class and tried to bribe other students to tell him the secret. That's dedication to a puzzle! Another student told me that this is the type of puzzle that leads people to commit suicide. I hope he was exaggerating. Kids were begging to play again on Monday to show off their Petals skills so they could get their membership cards and sign the poster. I've just never seen kids so excited about a brain teaser before. I guess I've never made such a big deal out of a brain teaser before, though. Meanwhile, I kept standing in the hall, having an internal battle with myself regarding the high five thing. I'd told myself I was going to do it. Why wasn't I doing it?!? I peeked in the door to see if students were actually reading the instructions and getting the supplies out. A few students had complied with my request. The others were distracted by talking to their group members. I've decided to go back to having my desks in groups of four. Ignore the lack of decorations in various places. I'll finish decorating. Eventually. When the bell rang, I decided I was going to walk in the room and high five every single student who had gotten out the supplies like the board directed. The first few students I high fived gave me weird looks. I had trouble getting their attention. These were wimpy high fives. A few students excitedly held their hand up to get a high five, and I refused. Eventually, they figured out that only those with supplies had got high fives. 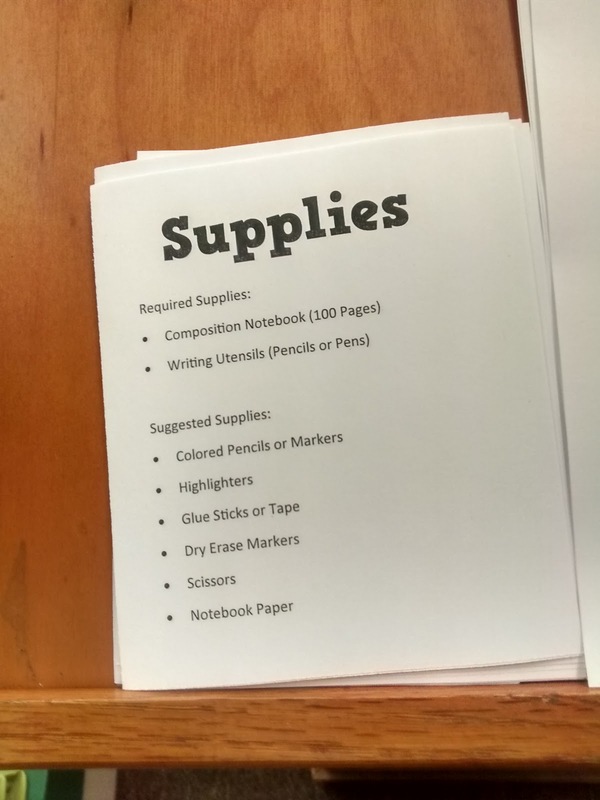 Once the other students got their supplies, I gave them a high five, too. I did this 2nd, 3rd, 4th, and 5th hour. 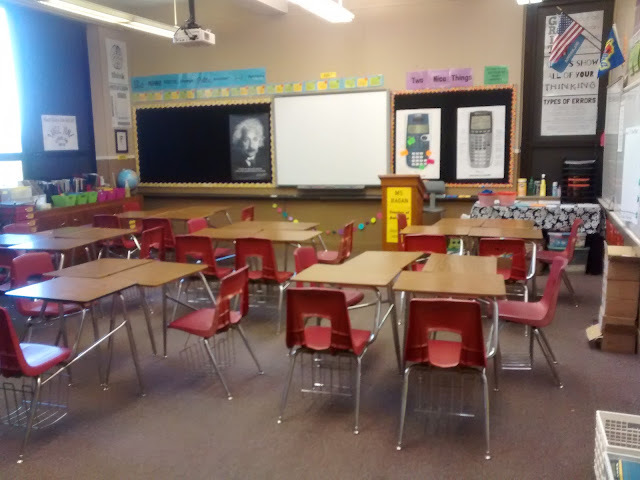 6th hour Algebra 1 came in, and not a single student got supplies. So, no high fives. I guess I was feeling a little frustrated because I didn't end up giving a single high five that hour. I had to tell them to read the board, and even then, it took a long time for anyone to realize they were supposed to be doing something. The next class comes in. Again, not a single student reads the SMARTboard. :( No high fives that hour either. I wish high fiving students came easier to me. I wish I could say it made a huge difference in my class demeanor. But, I haven't seen that yet. Once all the students had their supplies, I announced that they would be taking a quiz. I set the SMARTboard timer for 4 minutes. They moaned and groaned about having to take a quiz on the first day of school. Though, most of that stopped when they saw the questions. The students who have had me before obviously excelled at this quiz. My incoming freshmen were just guessing. I think both of those scenarios are okay. I gave them four minutes to take the quiz, then I went over the answers. The student with the highest score got a super star badge sticker to wear for the rest of the day. My high school students are obsessed with stickers. I heard so many times, "Why can't we all have a sticker? Don't you think we're all super stars?" I had to include a pic of my birthday cake that a student made for me last year! Next, I tried to squelch the rumor that I'm a crazy cat lady. 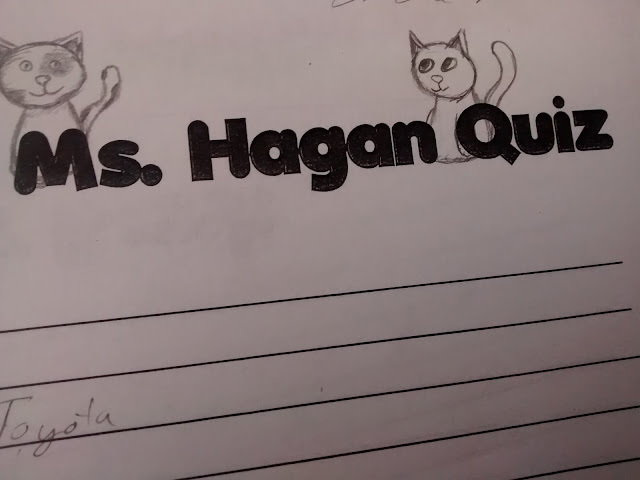 Once student said I had 67 cats on their quiz. This. Is. Unacceptable. More proof I need to share this fact with the school? I don't think this picture needs a caption. This led to some interesting conversations. Is 3.14 a correct answer? Several students tried to convince me that they just rounded pi to 3. Uhmmmm...no. I grew up an hour and fifteen minutes away from where I teach now. Some observant students used my TU flag that's hanging on the wall to help them with this question. Then, we talked about my "engaging" summer vacation. The kangaroo sitting on my desk could have served as a clue to this one! 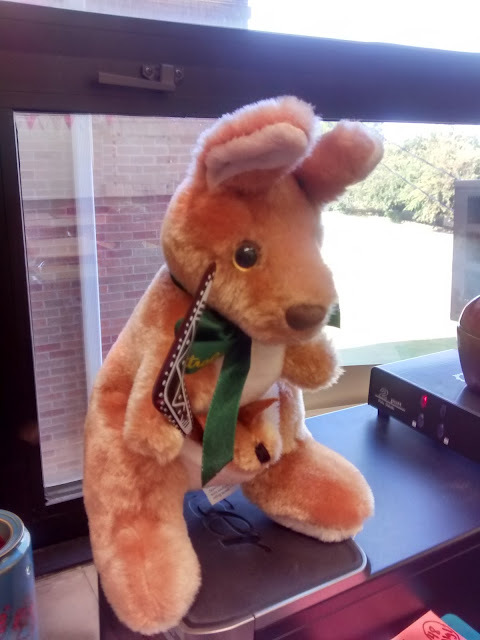 It took some students a little while to clue in that my trip to Australia and my fiance were connected... When they did realize it, they started making statements like "You're fiancee doesn't look Australian!" And, at least five students asked if he spoke with an Australian accent. Hello, he's from Australia. A few students were miffed that they only found out about my engagement today. Sorry! One student told me that another student and her had been talking about how they never expected me to get married because I have so many cats. Yes, the problem is real. My freshmen had no clue what NPR was... But, my students last year hadn't heard of NPR either. So many of my seniors were my first ever Algebra 1 students. We've been through a lot together. I think I'm definitely going to cry a lot at this year's graduation. 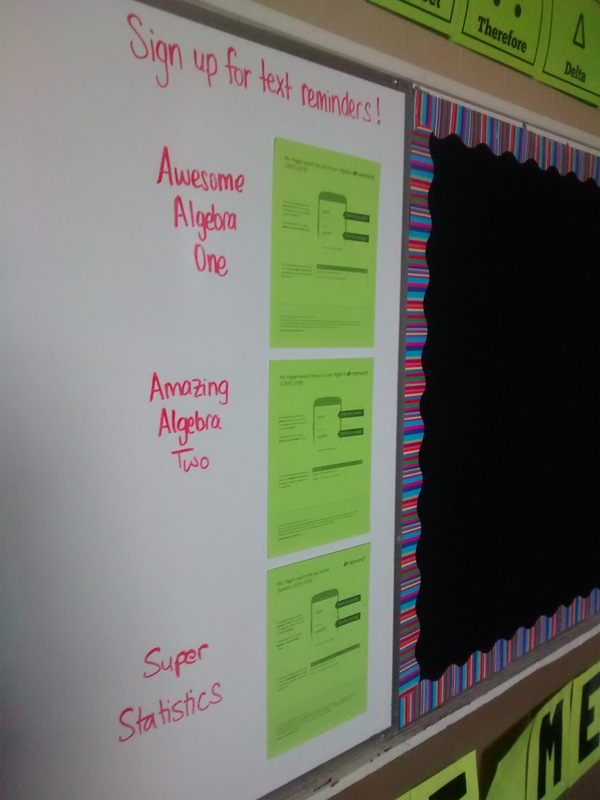 One student thought my blog would be called "Math is Awesome." I told them that math was awesome. Then, they assured me that was only their guess, not their actual feelings about math. Sad day. They were a little shocked about how many more followers I have than them on Twitter. "I didn't think you'd be that popular." Ouch. So many students thought I played the flute instead of the piano. Though, one said she was shocked at this question since I didn't seem musically inclined. Oh, my students are full of opinions! They turned their quizzes over to reveal a template for them to write a quiz for me to take. 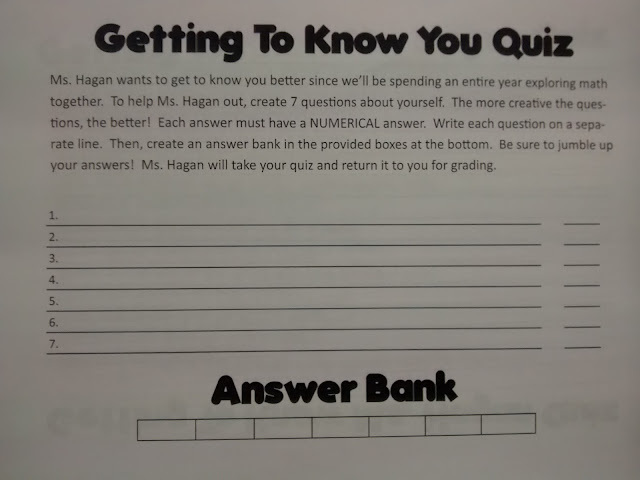 Students had to write 7 questions with numerical answers about themselves. They struggled a lot with the numerical part. Once student asked me what their last name was as one of their questions. To make it easier on me to take 100ish quizzes on the first night of the school year, I had my students make an answer bank for me. They argued that this wasn't very fair since I hadn't created an answer bank for them. 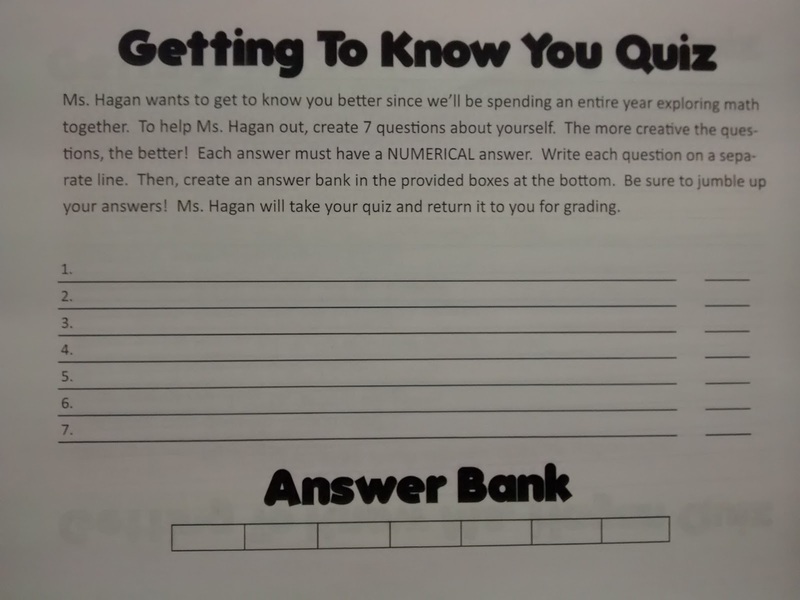 I was surprised by how much my students struggled with writing seven questions about themselves. After school, I spent probably an hour or so taking all of the quizzes. I don't know exactly how long it took because I kept getting distracted by other things! There were questions that made me laugh. Others that made me want to cry. Students wrote questions about health issues and family issues. Others were super silly. I tried to guess how many pounds students could squat and bench. I tried to guess shoe sizes. I found ages and birthdays pretty easy to figure out. But, I struggled with things like soccer jersey numbers and how many shoes they owned. Next, I gave a short little talk about what my class was going to be like since we weren't going over the syllabus until Day 2! My school has adopted a new cell phone policy that all of the teachers were supposed to go over. Ignore the misspelling. They've since replaced them with new posters, but I haven't taken a picture of the new poster. I got new carpet this summer, so that necessitates the no food or drinks policy. I am allowing bottled water. 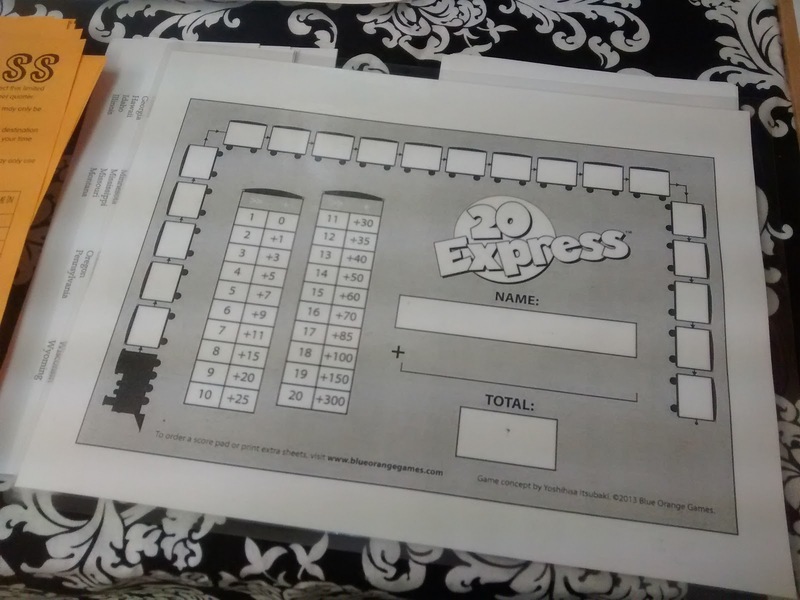 The Train Game is actually called Twenty Express. I got it as a Christmas present this past year from my sister. It's published by Blue Orange Games. Almost all of my students from last year have played it before, but this year's Algebra 2 classes are a mix of students who had me last year, students who had me two years ago, and students who have never had me before. The game was all new to my Algebra 1 students. And, I've had all my stats students before, but somehow a few of them had been gone every time we played the game last year. I had a terrible time trying to explain the game last year where students could understand it. So, I changed up my approach. They were confused at this point, but that was okay. We talked about what made a train and what wasn't a train. I wish I'd created more examples and non-examples. Oh well. There's always next time. Then, as a class, we circled the trains from left to right. This cleared up a whole lot of misconceptions that had persisted with the previous year's explanation. Next, I gave them some facts that I *hoped* sparked a REALLY important question. In some classes, the question was immediate. In other classes, the students seemed to except this information without it throwing up a red flag. Finally, someone would always ask, "How can that be?" Or, "Does that mean some of the numbers are repeated?" I told them that the numbers 11-19 were each duplicated. This gave us 39 chips instead of 30. Next, I projected a fake game card I had made up for them to analyze/score. As a class, we circled the trains and calculated how many points each train was worth. At this point, light bulbs were starting to go off about how this game worked. Next, I challenged them to try to beat my score. Finally, I passed out the game cards. I didn't want to pass them out any earlier than this because I figured students would be doodling with the dry erase markers! I printed the game cards off the Blue Orange website onto white card stock. Then, I ran the card stock through my laminator. This makes the boards eraseable. Here they are with my bag of bingo chips I use to call out the twenty numbers. 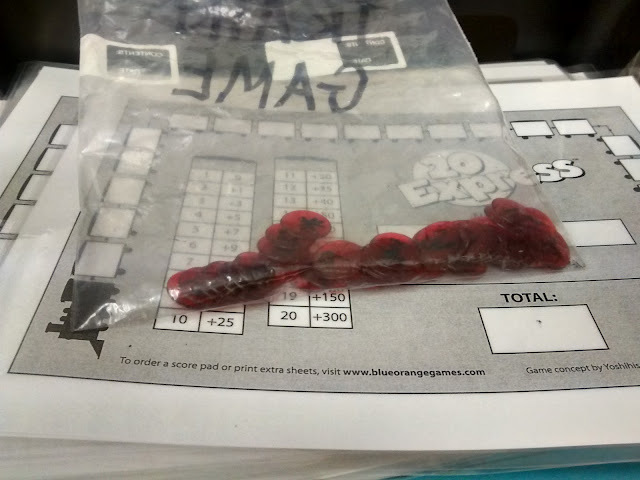 To play, I pulled twenty chips out of my bag, one at a time. Students wrote each chip down in a train car. Some students seemed confused at this instruction, so I told them to write each number down wherever they wanted. About halfway through the game, they started to realize that there is definitely some strategy involved. They wanted to play again after realizing this. I told them we would. Next Thursday! After calling all 20 chips, students calculated their score. Because we'd already scored my fake game card earlier, this was a very easy process. I only had to help a couple of students all day long. The winner in each class received a chocolate or strawberry ice cream cone ink pen that I picked up a dozen of last summer on Amazon Warehouse Deals Clearance for $3. Amazon still sells them, but they are much less of a bargain now. The kids thought they were cute. And, they were very disappointed when I only gave a pen to the student who got first place and not second. I like this train game because it involves critical thinking and a whole lot of luck. It's quick to play once you know the rules. I'm hoping we can knock out the entire game from start to finish in less than five minutes when I use it the rest of the year as a warm-up on Thursdays. The lamianted game boards were a little hard to erase, but a quick spritz of cleaner from Dollar Tree got them nice and shiny again. 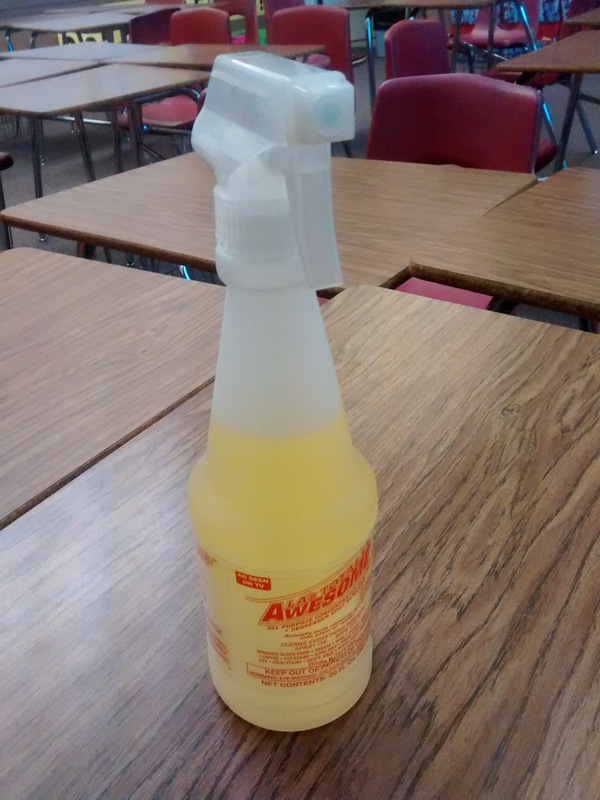 I had students pass the bottle around. Next, we started discussing supplies for the year since I knew a lot of families go school shopping after the first day. Next, I had students sign up for REMIND. I printed off their posters on green card stock, but I find it's easier to just have students do it all at once as a class. I like Remind because I can send students messages without either of us knowing each other's phone numbers. I've chosen to turn the chat feature OFF to keep it safer. I can send students messages, but they cannot reply. I gave the students a chance to ask questions. A few did. There was dead silence in other classes. There was about five minutes left in each class period to fill. So, I decided to give my students the Count to 10 Challenge. Tell the class that there is no talking unless they are saying a number. The class has to count from one to ten. Nobody can say more than one number in a row. If two students (or more!) say the same number at the same time, the class has to start over at one.